Ideal for seeding mixed beds where the annuals have not reseeded themselves or to rejuvenate a bed that has gone 'flat'. Made up of 26 annual species. Made up of 100% perennial flowers, this mix has 16 species which will bloom the spring following a fall planting. You will enjoy many years of colour. Approximate height: 36 - 40 inches. Made up of 22 species that are 40% Annuals and 58% Perennials to give lasting beauty with a wide variety of flowers and vibrant colours that will appeal to both Hummingbirds and Butterflies. Designed with the Northwest in mind, this most popular mix is made up of 24 species that are 60% annual and 40% perennials. Approximate height: 30 - 36 inches. 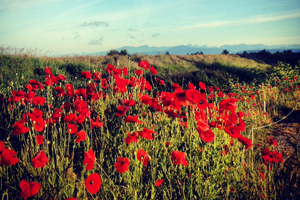 These flowers are designed to flourish in the drier climates or areas that do not get moisture on a regular basis. Made up of 50% annuals and 50% biennials/perennials. Approximate height: 36 - 48 inches. Made up of 24 species that are 70% annual and 30% perennial, these wildflowers are chosen for their natural beauty, long flowering periods, and low growing characteristics. Approximated height: 18 - 24 inches. Taylor's Mountain Wildflower Mix is designed to do exceptionally well in the mountain areas in Canada. 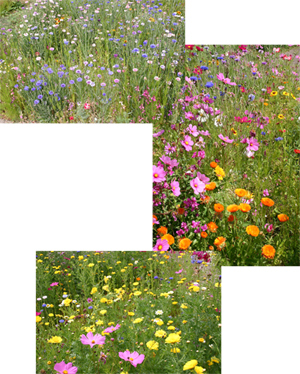 This mix consists of 20 species, 45% annuals and 55% biennials or perennials, which means the mix will give colour the first year and prosper for many years following. Approximate height: 36 - 48 inches. This mix will do very well with about 40% sun and filtered light. Ideal for those hard to establish areas that are shaded, this mix is up made up of 16 species of 55% annual and 45% biennial/ perennial. These blends are formulated to attract native bees, bumble bees, and other beneficial insects with nectar and pollen-rich flowers that bloom from mid-spring into fall.